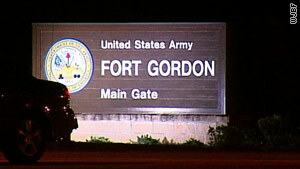 Bomb squads from Fort Gordon and Richmond County, Georgia, were called to a remote location on the base. (CNN) -- Military police at Fort Gordon, near Augusta, Georgia, have arrested a civilian for impersonating a soldier after "possible grenades" were found in his vehicle on base, a base spokesman said early Wednesday. The Fort Gordon and Richmond County bomb squads were called to a remote location on the base after a search of the vehicle the man had been driving uncovered "several possible grenades" and other "militarylike" items, according to Buz Yarnell, a base spokesman. The FBI is leading the investigation, he said. Authorities believe the man may have been involved in earlier thefts of military equipment at Fort Gordon, Yarnell said. A report of a suspicious person on the base Tuesday afternoon led military police to the suspect. CNN's Samuel Gardner contributed to this report.